Weren’t we just talking about hubris? Pride, and how it goes before the fall? For the record, Winstanley built two lighthouses. The first was damaged in 1699, so he fixed it by rebuilding it bigger and stronger. There have been a few lighthouses on the Eddystone rocks but Winstanley’s was the best-looking. 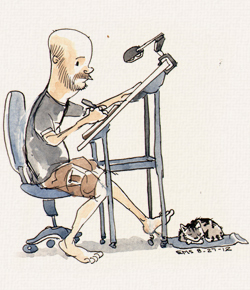 The existing sketches make it look for all the world like a Rube Goldberg machine to me. Read the interesting Night Takes Rook on Damn Interesting for the full story of Henry Winstanley and his lighthouse, including his run-in with and subsequent imprisonment by the French navy. 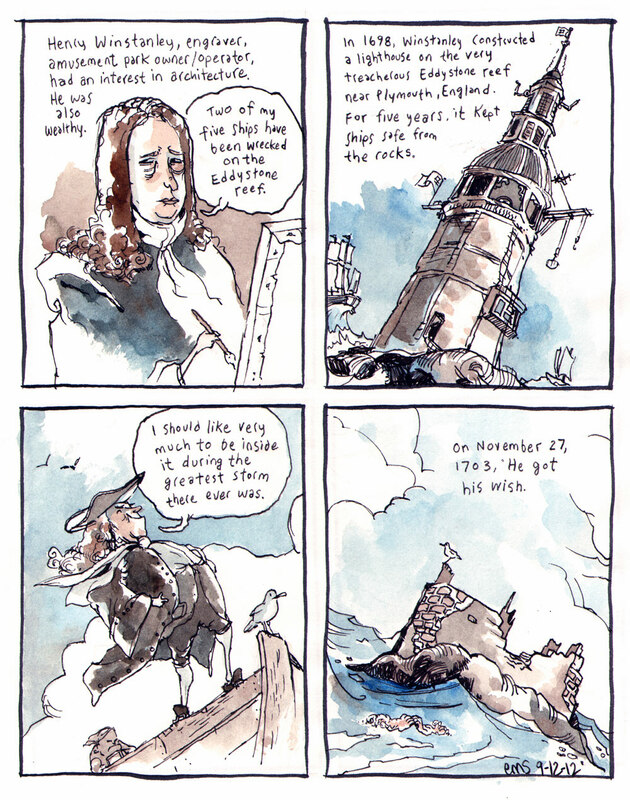 Panel 2: In 1698, Winstanley constructed a lighthouse on the very treacherous Eddystone reef near Plymouth, England. For five years, it kept ships safe from the rocks. Panel 4: On November 27, 1703, he got his wish. The lighthouse is destroyed and Winstanley’s wig floats in the sea nearby.